We are evaluation-obsessed, and in turn we suffer a ranking obsession. Unfortunately, most rankings are useless when it comes to the bottom line. The first post in this series was Fashion blogs: Is trust possible? Recently I came across a very interesting blog post by Beth Kanter about Facebook Insight. 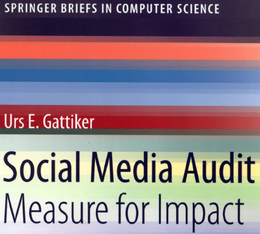 However, after reading it I was left wondering how Facebook got their data. Should understanding the methodology not be first on my agenda? Other people have suggested that Klout is no more trustworthy. Accordingly, which numbers, benchmarks, rankings, measurement tools and monitoring results should we use? See also, Welche Erfolgskriterien hat ein Fashion Blog? (German version of the first post in this series). 1. Why does your metric matter more than mine? You must ensure that the rationale behind using any type of rating or ranking makes sense to your stakeholders. If neither your boss nor client fully comprehend how you arrived at the numbers and what they mean in practice (think bottom line), you are in serious trouble. 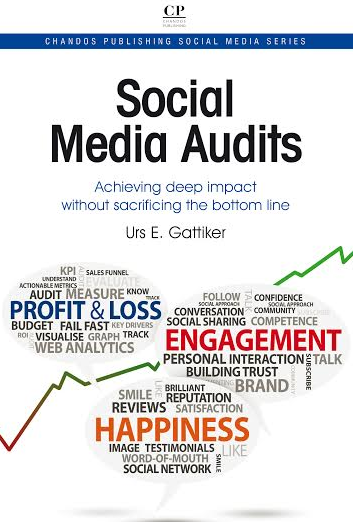 Make sure that your metrics help gain insight about the matters customers and management care about. If the amount of traffic is important, explain and demonstrate how this will relate to leads or advertising income on your blog (i.e. key drivers management cares about). 2. Why should I trust your numbers? If you do not spell out how you got your numbers, you are presenting a black box and your audience will probably complain about it. To illustrate, a recruiter that notices your score on Klout will think you have influence, something they want for their company, thereby improving your attractiveness as an employee. But wait! Since the recruiter cannot find any convincing information that Klout’s methodology measures what it says it does, they withhold judgment. Would you risking purchasing a house without seeing it first? Unlikely. So why should you do so with social media ratings, rankings and measurements – what makes them any different? 3. Shall we go for lunch? 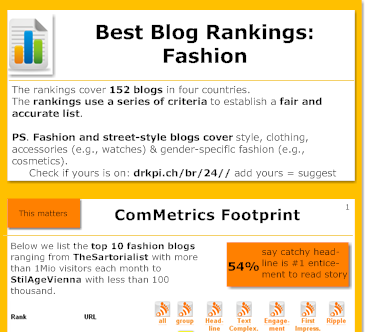 – Cision – top fashion blogs – UK, DE, US, etc. Fashion bloggers, brands, etc. imbue these rankings with an authority that is largely unjustified, especially considering many can be manipulated. This was sadly demonstrated during 2012 when several US universities gamed college rankings. Some have argued that trust remains an issue because brands are still wary of the many inexperienced bloggers posting about their Spring line-up at Milan or Paris Fashion Week. Moreover, the content is unmoderated and easily accessible. And of course, while some are very good at it (e.g., writing style, research done before publishing the content), others publish no more than rough drafts. Finally, as long as such rankings put Mashable (the news site for social media and Internet enthusiasts) as high up on the list as top universities such as Harvard, ETH Zurich or Cambridge, some questions remain regarding the quality and trustworthiness of these rankings. Customer beware – or be a fool. Get more ComMetrics content on Google, Fashion, design, trust ratings and rankings (just click the URL to get some very interesting results). Nice article Urs – and agree about inexperienced bloggers and marketers – they hurt our business and our reputation (like everyone is a guru, even in Data Science) – Trust, experience and the ability to communicate, VERY important! Thanks for writing! Thanks so much for stopping by and letting me know what you think about this issue. Sometimes I wonder if all it takes is making sure that one screams louder than the guy next door…. so many hear… and voila, one must be an expert. Quality over quantity…. unfortunately it is often the opposite. Previous post: Business analytics: Arbitrary rankings, anyone? Next post: Super Bowl: Is digital changing Coca-Cola’s choices?